However, inspection of the well indicates that it is a built folly or grotto with stalactite effect ceiling, and this was probably built by the Cramb family as a garden feature when the house, lodge and cottage were laid out in the early 19th century. In the 1940s and 50s the water still came out of a spout into a trough — which is still there mostly submerged in mud — and you would walk in on to an earth floor, which was dry, and drink from an iron cup. The last of the Cramb family, Miss Cramb, died in 1910. The Cramb family were great benefactors to the town, giving some of the front garden that fronted on to East Argyle Street — known as Hermitage Nurseries — for the construction of Hermitage School in 1880. They also presented the old Hermitage Primary playing fields to the east of the old school, now the site of Parklands School, to the school, and there used to be a wrought iron arch with the name Cramb Park until the late 1960s. The Cramb family are still remembered with the Cramb Medal presented to the Dux of Hermitage Academy each year. The house and park was sold to Helensburgh Town Council in 1911 for the sum of £3,750. It was used as a convalescent hospital during and after World War One, and after 1926 the Council used it as offices, a workshop and store, and there was also a gardener’s flat. The house fell into disrepair and was demolished in the mid-1960s. During the 1920s Hermitage Park was developed into a magnificent municipal park under the direction of Park Superintendent Mr Campbell, with well-maintained shrubs and flower beds. The bust of John Logie Baird used to be sited in the park but is now on West Clyde Street, and the Comet flywheel and the anvil from Henry Bell’s local blacksmiths, the Campbell brothers, were in the park before they were moved to the East Bay seafront in 2002 for the Burgh bicentenary. 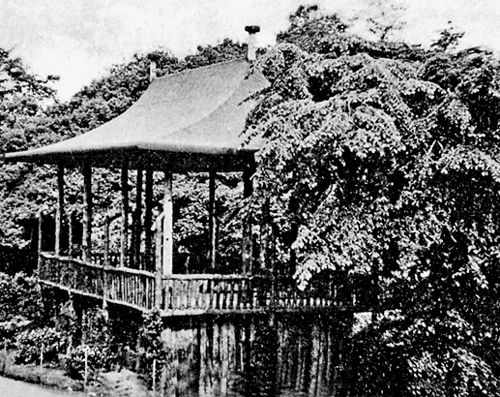 There was also a sundial, and a large wooden bandstand (left) which hosted Sunday afternoon concerts. In 1923 the war memorial was built on the site of Hermitage House’s walled garden, which also housed the glasshouses built against the north wall. Traces of ancillary buildings that accord with the map evidence are visible as scars on the walls. The war memorial was designed by Helensburgh architect Alexander Nisbet Paterson (1862-1947), who lived at the fine 1901 Arts and Crafts mansion Longcroft on West Rossdhu Drive, which he designed for his family. 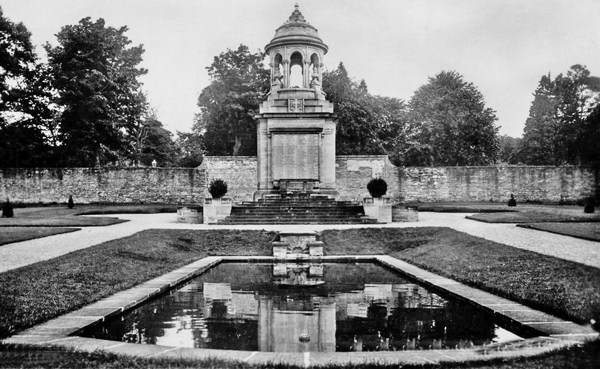 He was encouraged to enter the design competition for the war memorial by his friend and fellow Helensburgh resident, ‘Glasgow Boy’ James Whitelaw Hamilton, who also suggested the walled garden as its location. A.N.Paterson also designed Clyde Street School, another fine Arts and Crafts building now sadly in a state of neglect, as well as several other projects around the town including interiors. The war memorial and walled garden is an A Listed building and the walled garden is on the Buildings at Risk register. The walled garden is described as in poor condition but is in the low risk category. The war memorial and ornamental gates are not considered at risk. The walled garden was entered on the Buildings at Risk register in March 2010 because of the west wall collapsing in places and the north side being heavily overgrown. At the end of 2010 Babcock donated £2,000 to Helensburgh Heritage Trust for repairs, and the hole in the west wall was subsequently patched up. Argyll and Bute Council have estimated the costs of repairs to the site, including the leaking pond, at £30,000. A public bowling green funded by the Town Council, known both as Helensburgh Low Green and Hermitage Bowling Club, was opened in July 1926 by Councillor R.R.Herbertson, convener of the Parks Department of the Town Council. 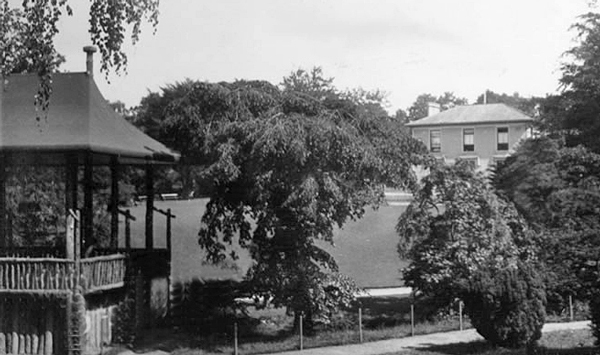 The tennis courts and putting green opened slightly earlier in 1925. These municipal sports facilities are located on the site of the mill dam for Malig Mill, with the tennis court built over the reservoir. 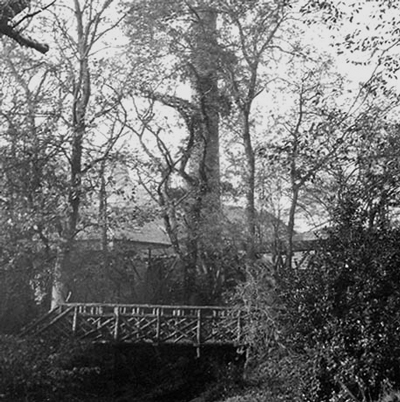 Millig Mill (also known as Muleig, Malig, Milligs or Milniggs Mill) was in the south west corner of Hermitage Park behind the Victoria Halls in an area known as the Mill Glen. The mill was there before the town, and map evidence dates it to at least the late 16th century. Blaeu’s Atlas of 1654 — based on maps by Timothy Pont made in the 1590s — shows Mulligs Mill, and it was established enough to be featured by Pont/Blaeu. This suggests it may be considerably older. Before Helensburgh was developed the area was known as Milligs, indicating the importance of the mill, and the burn that partially fed the mill is the Millig Burn. Moiglaig is included in a grant of lands from Maldoven Earl of Lennox to his brother Almelec which was confirmed by Alexander I on May 31 1225. In 1351 Muleig is confirmed to Walter de Fosselane by Donald Earl of Lennox, recognising a land charter by their predecessors Malcolm Earl of Lennox to Avileth, Lord of Fosselane. It is also on record that Aulay of Clan MacAulay, the descendents of the Lords of Faslane, purchased the lands of Milligs just after 1513. This suggest that there was a mill — hence the name Muleig — since the 13th century. Milligs and the lands along the Gareloch belonged to Clan MacAulay during the 17th century, and they had castles at Ardencaple and Faslane. In 1705 Clan MacAulay had to sell off its land and Mill, and its ‘£8 lands of Auld Extent’, and the mill was sold to Sir John Schaw of Greenock. In 1752 Sir John’s daughter sold the land on to Sir James Colquhoun of Luss. 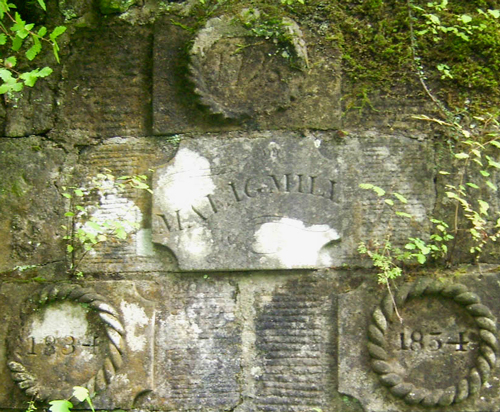 There are three date stones inside the mill, and a carved stone plaque bearing the inscription MALIG MILL. The recorded dates are 1796, 1834 and 1854. It is likely that the dates represent periods of expansion or modernisation at the mill. However, the earliest miller known of is Alexander McNeilage in 1776, although further research might bring more details to light. Robert Lennox, a maltster, of 3 Colquhoun Street, took over the mill in 1834 which probably accounts for this date stone. Lennox was a maltster suggesting malting barley for brewing beer and also supplying the Helensburgh Distillery on the corner of Argyle and Maitland Street, before the railway arrived. Helensburgh was expanding in the 1830s and the growing population — 2000 in 1832 — would have required a brewery to supply almost 30 public houses recorded in Rhu parish at that time. The Mill Dam was also of use to the local distilling industry. An 1838 advert for the sale of the lease of the Helensburgh Distillery, which produced 800 gallons of whisky a week, stated that ‘the water is of the finest quality for fine malt whisky, being collected over nearly three acres of moss in a long dam’ — the Mill Dam. The Helensburgh Directories (Battrum’s Directory) record a number of the occupiers of the mill. R.MacFarlane and Son ran the mill site for a number of years and in 1911-12 the Helensburgh Directory listed a motor garage at the same address as the mill, 86 Sinclair Street. A planning application in 1912 for the addition of a stable to the end of the grain store indicates that the west side of the building had a hay store on the north side and a grains store on the south side. There were three adjacent buildings, shown on the 1895 Second Edition OS map, which in 1912 were in use as a motor and coach house, a motor house (garage) and a coach house. The last known occupier of the mill was John Brown, farmer and merchant. 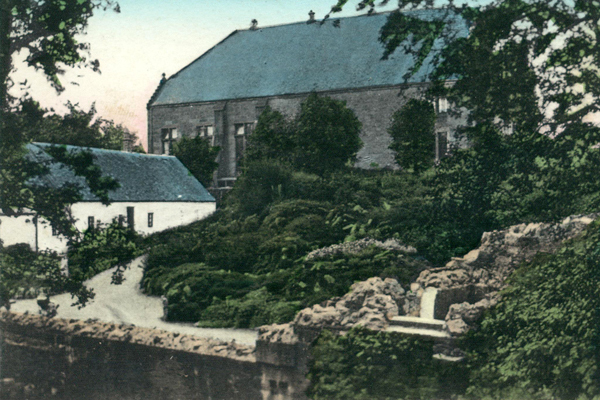 The mill, including the mill buildings, mill dam (left), lade, mill pond and land to the south east, was gifted to the town by Sir Iain Colquhoun of Luss in 1919, and the mill and ancillary structures were demolished in 1922. The Helensburgh and Gareloch Times of June 7 1922 records the demolition of the mill on its front page and offers the stones for sale at the cost of 15 shillings per cart or 10 shillings per ton to be collected from the site. Walter S.Bryden of local emporium MacNeur and Bryden in East Princes Street recalled the mill before it was demolished in an article he wrote for a special Civic Week supplement that accompanied the Helensburgh Advertiser of May 9 1975. He recalled the tall chimney stack (below right) and the stagnant mill dam where two tennis courts were later. One court remains now. He said the mill had a high wheel powered by water from the burn and from a large area of dam. The visible remains of the mill today represent a fraction of the full extent of the mill, which was about four times the size of what is now standing. The surviving remains make it difficult to understand how the mill worked, but map evidence gives a clear indication of the location of the dam or reservoir, the sluices and lade, and the location of the wheel and outflow mill pond. The mill lade can be traced into the grounds of Lansdowne on the north side of Victoria Road in the mid 19th century, and it can still be seen in the grounds of Chapelacre. The First Edition Ordnance Survey map, c.1860, shows the mill lade diverging from the Millig Burn at a weir located just to the west of East Milligs Farm. The mill lade is still visible and you walk over it when entering the park from the northern Sinclair Street main park entrance. It is possible that it runs under the garden at Dhuhill House at the top of Sinclair Street. The lade fed the dam or reservoir which was located where the tennis court and skateboard area are now. The mill dam was originally a large sub-rectangular earthwork to contain the head of water needed to turn the mill wheel. There were two outflows from the mill dam. One was by a sluice emptying into Millig Burn near the location of the bandstand, and the other was a lade, quite probably a raised wooden structure, that ran directly to the mill from the south east corner of the reservoir. The earth bank that carried the lade channel is clearly visible in the park. The mill wheel, which was located on the east side of the mill in the burn, was turned by water flowing down the lade and down the Millig Burn. 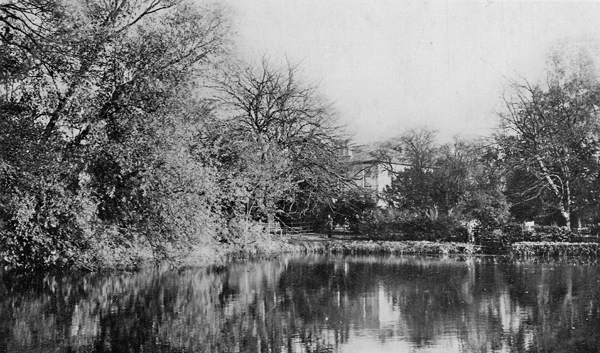 The mill pond where the spent water collected is located immediately south of the mill, but is now overgrown. Early photographs and written records suggest it had an overshot wheel, which means the water was fed onto the wheel from the top — as opposed to a breast shot or undershot mill wheel. However, if it was also fed by the burn, it must have been a combination of both overshot and undershot. The Millig burn is canalised and has stone built banks from where the sluice enters it, suggesting controlled water flow and that the mill wheel might have been fed by both undershot and overshot water, though perhaps not at the same time. Clearance and investigation of the burn immediately adjacent to the mill would reveal how the water was fed in to the mill wheel and confirm what type it was. The presence of a chimney at the mill suggests that corn drying and malting also took place at the establishment. The basic operation of a mill is that the water power turns the mill wheel which then turns machinery that turns the grinding stones. The grain is fed into the grinding stones from above on the second storey and the resulting milled grain or flour is collected in a hopper set to the side of the mill stones. Some millstones are visible at Maligs Mill and the pattern on the stones would have determined the fineness of the flour. The products of the mill, which was a corn mill, were stored at the Granary, which used to stand at the bottom of Sinclair Street and was again a building that pre-dates the development of Helensburgh as a planned town in the late 18th century. The Granary, or malt barn, was located for ease of access to water transport for the grain and flour. Further research would be required to determine if grain was brought in from outside the district for milling, and the size of the mill in the late 19th century suggests it was quite a large commercial operation. Originally in the 17th century, or earlier, the mill would have served the surrounding farms on MacAulay land such as Milligs and Ardencaple — both of which had east, west and mains/mid farms — and probably also Woodend. The Statistical Account of 1790 records that oats and bear (barley) were produced in the district and there was a surplus, which was exported. ‘Corn mill’ appears to be a general term for grain, and it is most likely that oats and barley were the main staples at the mill. 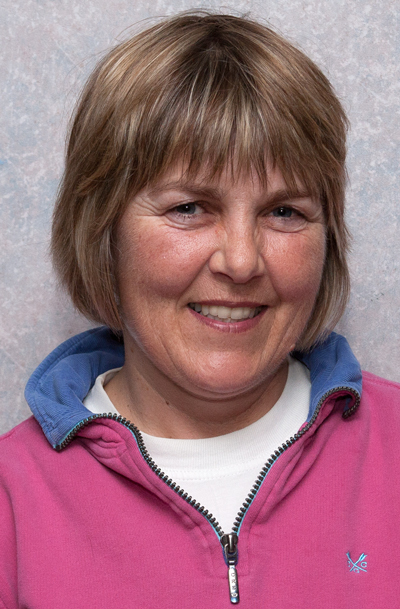 This article was prepared by Fiona Baker of Firat Archaeological Services, Hillcroft, Station Road, Rhu, as the text for a conducted walk in Hermitage Park in 2012.